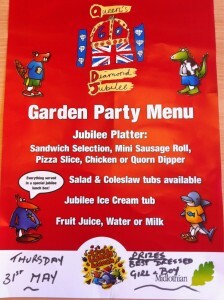 There are some events in school this week to mark the Queens Diamond Jubilee. 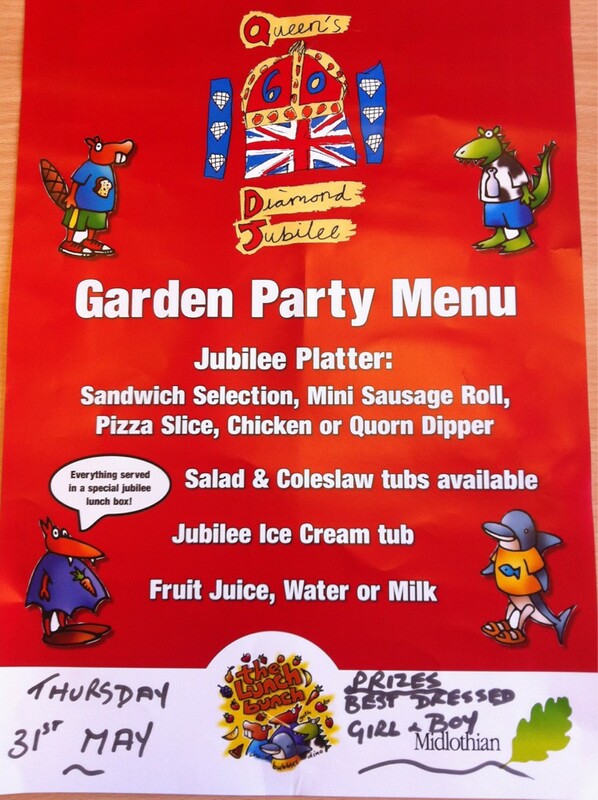 On Thursday 31st May there is a special Garden Party Lunch at school. Children are invited to dress up for the event and there will be a prize for the best dressed boy and girl. The cost of lunch is the usual £1.70. Jubilympics Fashion Show – Children are to dress in red, white and blue. Nursery & P1-4 – practise running races and old fashioned ones such as sack race or egg and spoon. Hope everyone has a fantastic time and looking forward to seeing some creative outfits. This meeting will also be used to organise the school summer fair. Your help with this will make the event a great success so if you can spare the time or are interested in being involved with the Parent Council please come along to the meeting. It is the contribution and efforts of parents and carers that make the Parent Council a success in raising additional funds to enhance the childrens learning experience so whatever you can do to help no matter how big or small is welcome. Primary five have had an exciting term learning about living things. They have learnt all about parts of plants and have even planted their own flowers to be added to our wildflower meadow. We have also been learning about types of animals and food chains which we were able to use on our trip to the Five Sisters Zoo. What an enjoyable day we had seeing all the animals. Some of us were even brave enough to hold a snake or tortoise! In amongst visiting the bears, dancing cockatoo and the meerkats, we found time to play in the soft play area! There was even a giant pirate ship! Our wonderful P1 teachers completed their marathon relay yesterday in very hot conditions so a huge well done to them we are all very proud of you. So far they have raised a magnificent £2473.00 for Edinburgh Sick Kids Friends Foundation in memory of Jude Hunter. There is still time to donate at www.justgiving.com/P1-Lasswade-Primary or send an envelope to the school office. Here’s some pictures of our ladies looking as fresh as a daisy at the end! Maybe it’ll inspire some of us for next year or a future Olympics? Don’t forget the school is closed to pupils on Monday for an In Service Day. Back on Tuesday. P2 recently visited Edinburgh zoo. It was a really exciting trip. We had a lesson from the zookeeper who showed us some animals which live in Asia. 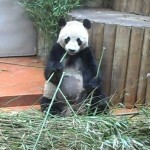 Then we saw the pandas. Their names are Sunshine and Sweetie. 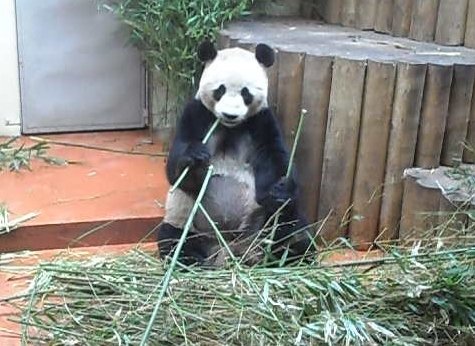 Sunshine was having a sleep but Sweetie was eating some bamboo. We learned lots of facts about pandas. Did you know that panda boys do handstands when they want to impress a panda girl. Also pandas do the toilet between 50 and 100 times a day!!! We also had fun taking part in Jubilee Masterclasses. We worked in groups with children from other classes. Some of the activities included painting the Queen and the Union Jack, making crowns and invitations, decorating cakes, making bunting, designing an outfit for the Queen, dancing and singing from the 1950s. To support our P1 staff who are running the marathon on Sunday 27 May we are going to have a dress down day on Friday 25 May. The children can wear anything sporty! Children can bring a donation of 50p or £1 to support our fundraising for the Sick Children’s Hospital. Here’s our newsletter with information on the fabulous work being done in the Wildlife Garden, Sports Days and much more. Many thanks to all the parents who baked, supported and came along to P6’s Coffee Morning. £188.95 was raised and along with £85.40 from their anagram competition before Easter, they will be giving Maggie a cheque for £274.35 on her return from Tanzania. This money will help build a holding tank for the village well, but surprisingly the same amount of money could teach 13 children for one year, or one child for 13 year. Here is an update from the SQA regarding the New National Qualifications for parents and carers. A guide about the new qualifications is now available for parents and carers. It is available to download from the dedicated section of our website – www.sqa.org.uk/cfeforparents. There is also a guide for young people at www.sqa.org.uk/cfeforyoungpeople and updated guides for teachers and employers. We have now reached a major milestone in the development process and final documents for the new National 2 to Higher Courses are available. The final documents will be used by teachers and lecturers to prepare to teach each new Course. The documents are still of interest to parents and carers as they give information about the skills and knowledge young people will gain. Use the subject drop-down menu on our website: www.sqa.org.uk/curriculumforexcellence to find the documents for each subject. To develop these 197 qualifications we have had targeted engagement with over 5,000 practitioners and other stakeholders. We have had nearly 600,000 visits of the subject pages on the website and more than 3,400 comments on the draft documents we published at each stage of the process for review and feedback. We have attended over 700 meetings and 15 events and our development groups, which include parent and carer representatives, have met over 440 times. Two new Courses – Music Technology and Fashion and Textile Technology have been developed in response to feedback throughout the development process. The new Courses in Music Technology are from National 3 to Higher. A new Higher Course has been developed for Fashion and Textile Technology. We have now begun developing the new Advanced Higher qualifications which will be introduced in 2015/16 and the first draft documents have been published. Use the subject drop-down menu at www.sqa.org.uk/curriculumforexcellence to find the documents for each subject.